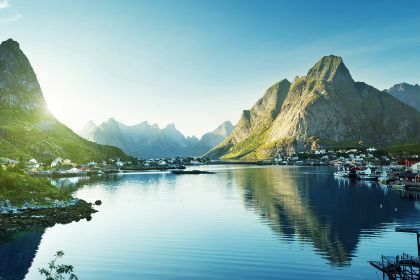 With its dramatic fjords, pristine landscapes, exquisite coastal scenery, the Midnight Sun, and deeply evocative culture and history, Norway lives up to its top billing as a truly fascinating travel destination. What better jumping-off point than Bergen? You cannot help but be impressed. 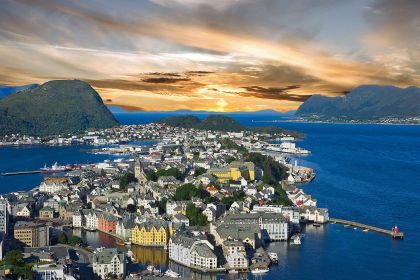 It’s one of a kind — not only is it the southern gateway to the kingdom of the fjords, it is Norway’s ancient capital, and stunningly beautiful to boot. Located on the southwestern coast, it is surrounded by mountains and fjords guaranteed to take your breath away. There’s an extensive list of activities on offer: glacier walking, fishing on a working whale boat, kayaking, rafting, golfing at one of several first-class golf centres, and horseback riding in remote and wild landscapes. 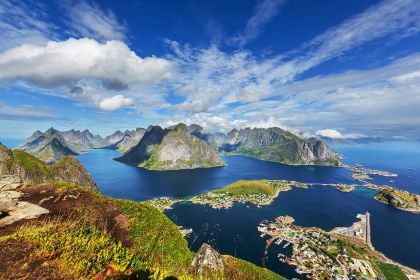 Not to mention the popular pastime of hiking in some magnificent mountains, or opting for a cable-car ride to get a bird’s eye views of the town, the jagged peaks, the fjords... You can even sample whale-meat stew! There are enough exhilarating adventures to keep you entertained for months. Little wonder that visitors keep returning. 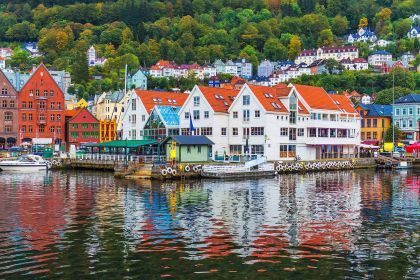 You’re guaranteed to fall in love with Bergen’s charms. Bergen is a yacht-lover’s paradise, strategically situated as it is between two imposing fjords: Hardangerfjord and Sognefjord. Hardangerfjord is dubbed the queen of fjords for its unspoilt beauty, while Sognefjord can boast of being the largest natural fjord in the world. Cruising between the imposing cliffs, past emerald green clearings and pretty coastal towns cannot but overwhelm you, offer hours of ultimate relaxation and a multitude of sweet memories. Flam reflects the adage that dynamite comes in small packages. You will quickly be seduced by the charms of this tiny village, certainly one of Norway’s most dramatic and spectacular sites. 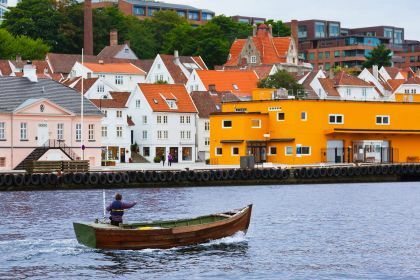 Close your eyes and imagine myriad waterfalls, deep valleys, steep cliffs, seals, eagles, frothy local beer, log fires in cheerful restaurants, reindeer stew, fresh salmon, and dazzlingly beautiful hiking trails. Take a trip on the impressive Flåm Railway or explore the Aurlandsfjord and Nærøyfjord. 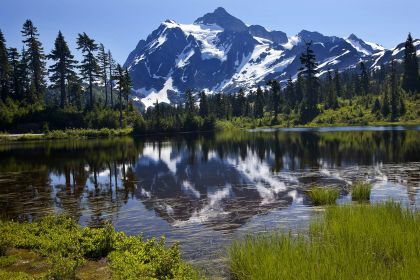 Your view will be one of perfectly transparent, turquoise water, playful porpoises, jagged cliffs, snow-capped mountains, rushing waterfalls and soaring seagulls. You may have to pinch yourself as reminder that it’s the 21st century and you’re on a luxury yachting vacation — not a medieval quest on a Viking ship. Whether you choose to hike the trail to the top of Brekkefossen waterfall, visit the railway museum, take a ride on the famed railway or sample freshly caught salmon from pure mountain rivers, you are sure to be bewitched by this tiny village in its grand surrounds. There are scores of reasons to include Olden in your northern yachting adventure, but here’s a great one for starters: the Briksdalsbreen glacier hike. You will be rewarded with panoramic views, gushing waterfalls, a shimmering lake left behind by the retreating glacier, verdant forests and wonderfully fresh air. The joy of arriving in Olden on your own luxury yacht is the icing on Norway’s cake. You will be spared the nuisance of tourist throngs, guided tours and manic picture snapping. On your yachting vacation, you can enjoy the magnificent sites with exclusivity, discernment and tranquillity. Visit the famous Briksdalen glacier, a magnet for visitors drawn by its setting between roaring waterfalls and high peaks. Located in Jostedalsbreen National Park, you can visit the glacier on foot or catch a ride with one of the so-called “trollcars”. The hike takes less than an hour, is only moderately strenuous and well worth the effort. You can rest along the way and take a breather on one of the many benches dotted along the route. Kick back and feast your eyes on rainbows above the waterfall mist, sunlight reflecting from the glacier, snow-capped mountains and the glacial lake. You can rent a rubber raft to get really close to the glacier, or take a boat trip on Lake Leon for unrivalled serenity and isolation —it’s very likely that your boat will be the only one on the whole lake. Briksdal glacier, Kjenndalen glacier, Kleivafossen waterfall, and cycling and kayaking on the Nordfjord will conspire to keep you in Olden for quite some time, but the spectacular Geiranger fjord is beckoning you… Hop aboard your yacht and keep moving. Did you know you could walk behind a waterfall? Well you can — at Storseterfossen in Geiranger. And if that is not unique enough for you, taste the unusual blue-cheese chocolate in the area. This is just the beginning of Geiranger’s appeal. A village in the western part of Norway, Geiranger is an area of steep mountains, emerald-green grass, deep fjords, pastoral sheep and unmatched vistas. 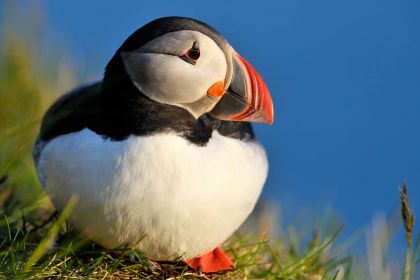 You can lounge on the deck of your yacht and, in comfort and leisure, watch this movie unfold in front of you, or take a three-hour trip up to the Dalsnibba Mountain Plateau to catch some fabulous bird’s eye views. The waterfalls, with icy-cold water from glaciers and mountain snowcaps, add to the dramatic beauty of the panoramas. Cruising along the fjord, you can feast your eyes on the famous Seven Sisters waterfall. 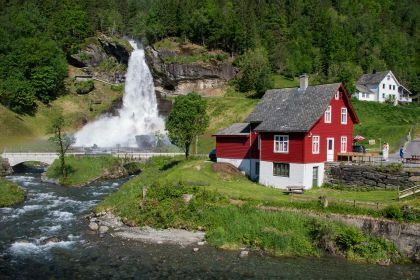 Or even visit the Knivsfla mountain farm, one of a handful of historic farms on the steep mountainsides along the Geirangerfjorden. Abandoned since the 1600s, it will afford you a glimpse into a bygone age in an isolated Scandinavian setting. When you need to warm the cockles, sample some of Geiranger’s culinary delights. For hearty meals with traditional local ingredients, visit the recommended Brasserie Posten; for unusual chocolate tastes and flavours, Geiranger Sjokolade is the ideal spot to pick up a few gifts for your friends and family, and when it comes to toasting your good fortune and your gorgeous surrounds, try the delectable local beers and ales found in most of the Geiranger’s restaurants. Feel free to contact your Abberley charter broker here or call us with any questions you may have. 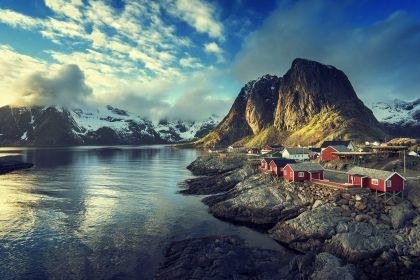 We’ll help you achieve your dream — a fascinating yachting vacation in Norway or any other yachting hotspot in Europe or anywhere in the world.